Posted September 12, 2014 by Heather Michet & filed under Food, Food As Medicine, Recipes. Kale is busting out all over (sing to the tune of “June is busting out all over.”) in gardens and farmers markets now. There are so many ways to enjoy this ; I suggest you play around and discover your favorite ways to enjoy it and give it regular appearances in meals and snacks. It is the favored green in my green smoothies, one of the vegetables added to quiche, and the main character in this delicious salad. One of the things I’ve done to make it super easy to put this salad together – even just a single serving – is to double the dressing recipe, grate extra carrot, and toast additional sunflower seeds. Store the “extra” dressing and carrots in the fridge and they’re ready when you want to assemble the next salad. It is a cruciferous vegetable belonging to the Brassica family, a group of vegetables that includes cabbage, collard greens, and Brussels sprouts. A study found that people who ate the most cruciferous vegetables had a 29% lower risk of bladder cancer than those eating the least of this family of vegetables. Combine first 5 ingredients in a small bowl with a fork, blending until smooth. Add remaining ingredients. To serve: Add kale to serving bowl and top with additional ingredients of choice. 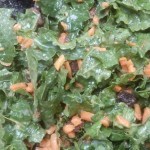 Add some dressing and stir into salad well so all kale leaves are coated. This salad is super willing to be flexible to your tastes. Modify the ingredients and/or their quantities. Change-up the proportions of the dressing ingredients: maybe you’re not that fond of ginger or garlic, reduce them. Make it yours so that you eat it and love it, as you ingest a bowlful of healthy nutrition. Bon appetit!